In the same week when all six Star Wars films appear on Blu-ray with a brand, spanking new six-channel soundtrack, Acoustic Energy has launched the Compact Neo 6.1 system. This £850 setup matches the existing Neo subwoofer with six Compact One speakers. Having six identical speakers does achieve the home cinema holy grail endorsed by his beardiness, George Lucas, of placing identical speakers in all positions for seamless handover from position to position. Finished in Vermont Walnut, each cabinet feels solid and looks smart, too. The silver panel is possibly a little sudden in an otherwise all-black system, but there are grilles for this situation. Wall mounts are also supplied, but these negate using the banana plugs with the sturdy binding post terminals on the rear. It could also result in some 'chuffing' from the rear-mounted bass port. The subwoofer is the Neo V2 model that is also part of the more expensive Neo lineup. This is a sealed box design packing a 8.5-inch driver and 200W amp, along with a busy rear panel that incorporates notch and cut filters. These, coupled with the sealed design, make for a reasonably simple placement. The identical wrap and similar appearance gives the Compact Neo 6.1 a fairly homogenous look. It is also an altogether more serious device than many similarly priced sub/sat systems and promises to give the Neo Compact some reasonable low-end heft. Indeed, match this relatively burly subwoofer with a 'satellite' that is also sold as a stereo speaker and you get something subtly different from the competition. Given the splendidly silly Fast Five to play with, these speakers make a convincing case for themselves. The huge amounts of gunfire, engines and shouting are separated effectively and it is easy to keep track of events on screen. The Compacts balance good detail levels with a smooth presentation that helps less well-mastered soundtracks sound cohesive. Dialogue sounds rich and realistic. 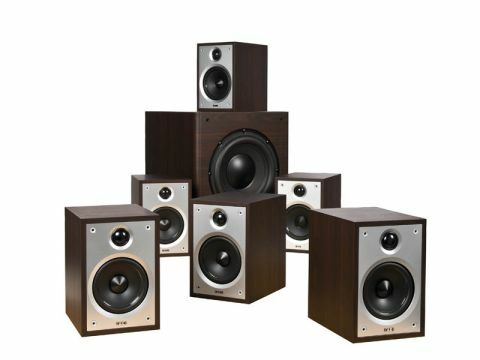 Pushed hard, the speakers will start to harden up slightly, but in any normal-sized lounge, the Compacts are capable of creating a room-filling sound. This is partly due to the use of fabric tweeters rather than the more common metal types used by much of the competition. There is always a worry that the lack of a dedicated centre speaker will constrain dialogue, but this is not a problem. With a crossover set at 65kHZ for all speakers, the handover between Compacts and subwoofer is very smooth and occurs at a point just about low enough to enjoy the benefits of omnidirectional bass. Where this really comes into its own, is with music. With both multichannel and stereo material, the Acoustic Energys benefit hugely from the satellites' ability to handle all but the bottom octave of a music performance. The sub is not the fastest, but agile enough to make for an entertaining listen. Overall, this array falls somewhere between a conventional sub/sat package and a larger speaker/sub combo, and combines many of the attributes of both. The Compacts are small enough to fit into most places, while offering a performance that dinkier models often can't match. So, as a cost-effective system that does equal justice to films and music, the Compact 6.1 has a great deal to commend it – as long as you don't mind having an odd-looking centre speaker.